One of the most prestigious bracelets of the 2018 World Series of Poker was awarded today, and it went to a man who has now won the event an unprecedented three times. Tuesday also saw one other bracelet handed out. It was almost a three-bracelet day, but two players ended the Super Seniors event heads-up, so we’ll have to wait until tomorrow to find who will take down their first WSOP gold. Here’s all the news from June 19. Maybe it was on the cards all the way back on Day 2. 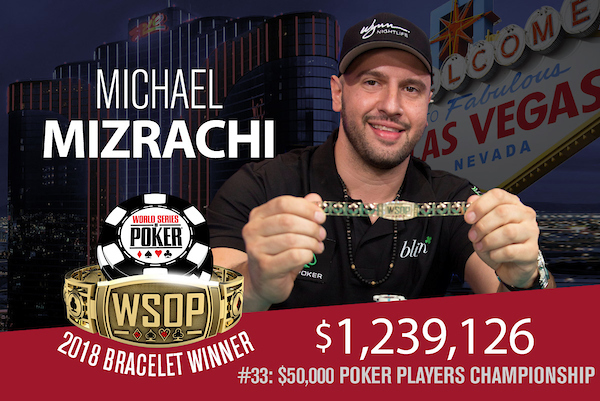 Michael ‘The Grinder’ Mizrachi bagged the chip lead that night in Event #33: $50,000 Poker Players Championship, and then finished Day 3 as the chip leader too. He then had by far the biggest stack after Day 4, entering Tuesday’s final table in pole position. Now, The Grinder is a four-time bracelet winner, a three-time PPC champion, and $1,239,126 richer. Aaron Katz was the first to fall today, when his top pair was outdrawn by Benny Glaser’s bottom pair and backdoor flush draw. Glaser and Mike Leah remained the short stacks during five-handed play, and ultimately Glaser would exit in fifth. He lost a large chunk of his stack in a stud hand, when he made a value bet with two pair on seventh street only for John Hennigan to call with a better two pair. Leah then felted Glaser a little later in a 2-7 hand. Leah managed a double up shortly after, but that couldn’t prevent him from finishing in fourth, busting to Mizrachi in a PLO pot. Dan Smith would then depart in a limit hold’em hand. Smith had an open-ended straight draw to Hennigan’s ace-high with two overs, but the board bricked for Smith. Hennigan, a former PPC winner, lost two big 2-7 hands to Mizrachi right off the bat in heads-up play. It all ended in NLHE, with Hennigan shoving a flop with an open-ender and Grinder calling with a pair and flush draw which hit on the turn. A huge crowd then burst onto the stage to congratulate your 2018 $50K PPC champion, Michael Mizrachi. Only three players returned Tuesday in Event #35: $1,500 Mixed Omaha, and Yueqi Zhu of China had a dominating lead with almost 80% of the chips in play. It didn’t take long for Zhu to seal the deal today and win his first WSOP bracelet. The only player who already had a bracelet, Carol Fuchs, went out in third, followed by a brief heads-up match versus Gabriel Ramos. Zhu had a 10:1 advantage, but Ramos almost doubled up when his top set was all-in versus Zhu’s wrap in a PLO-8 hand. Zhu’s draw then completed to give him the win. 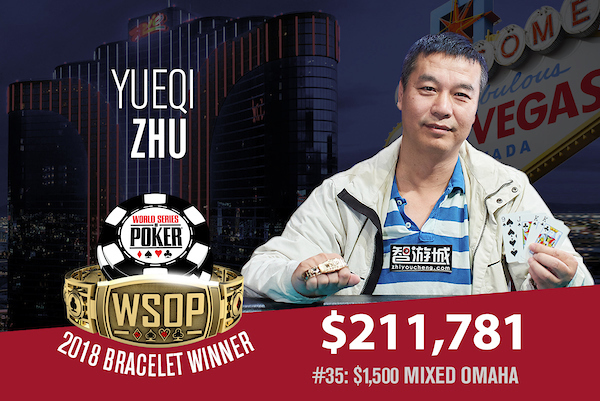 After more than 12 years of grinding at the WSOP and some 70 cashes, including a second-place finish back in 2006, Zhu is now a bracelet winner and $211,781 richer. Day 3 of Event #34: $1,000 Double Stack No Limit Hold’em played out today, taking the field from 162 (of 5,700 total) down to just 20. Keith Ferrera holds the overnight lead with a stack of 7,550,000, more than 2 million in chips more than the closest competitor, Tomas Teran Paredes (5,050,000). Robert Peacock completes the top three stacks with 4,500,000. Other notables returning tomorrow include Matt Stout (3,920,000), Joshua Turner (3,905,000), Pfizer Jordan (2,450,000), Pablo Fernandez (1,760,000), Ramin Hajiyev (1,420,000) and WSOP bracelet winner Andrey Zaichenko (1,205,000). Throughout the course of action we lost the likes of Jake Bazeley (141st place), WSOP bracelet winners Phil Hui (107th place), Anthony Spinella (101st place), Nipun Java (87th place) and Tony Dunst (69th place), as well as Maria Lampropulos (79th place), Isaac Baron (66th place), Mike Del Vecchio (51st place) and Matt Berkey (24th place). All 20 are guaranteed a $22,122 payday, but it’s the $644,224 first-place prize they’re really after. Action resumes at 12pm Wednesday. Action ended heads-up after Day 3 of the Event #36: $1,000 Super Seniors No-Limit Hold’em, with Robert Beach holding a massive chip lead over Farhintaj Bonyadi. Beach will return tomorrow with 9,010,000 to Bonyadj’s 1,975,000. The runner-up will receive $192,397, while the winner will bank $311,451. Action kicks back off at 11am tomorrow, with blinds at 50K/100K. Check back tomorrow to find out if Beach can get the job done. A final table has been set in Event #38: $10,000 Seven Card Stud Championship. With eight players of the 83-strong field left, it’s Yaniv Birman who enters the finale as chip leader. Birman bagged up 958,000 – 40 big bets, and he’s followed by multiple bracelet winner Jesse Martin (916,000). Mixed game beasts Ben Yu (559,000), James Obst (216,000), and Matt Grapenthien (507,000) will also return tomorrow. Throughout the day we lost the likes of Daniel Negreanu, Jordan Siegel, Michael McKenna, Perry Friedman and Todd Brunson. All eight have locked up $23,443, while there’s $236,238 up top. Play kicks back off at 2pm Wednesday. Event #39: $1,500 No-Limit Hold’em SHOOTOUT kicked off today, with 908 runners hoping to win their first table in order to proceed. 100 players did just that, and there are some big names amongst them. Phil Hellmuth took down his table to become one of the first Day 2 players, defeating the likes of Heidi May and Maurice Hawkins. Other notables to advance include reigning WSOP Main Event Champion Scott Blumstein, last year’s runner-up in this event Thomas Boivin, as well as Steven Wolansky, Rep Porter, 2014 Main Event Champion Martin Jacobson, Matthew Waxman, Georgios Sotiropoulos, Arkadiy Tsinis, Justin Liberto, and William Kakon. Where there are survivors there must be casualties. Some of those who couldn’t make it through today include Ryan Riess, Qui Nguyen, Joe Cada, Erik Seidel, Joe McKeehen, Brian Yoon, Mark Radoja, Michael Gagliano, Barny Boatman, Humberto Brenes, Annette Obrestad, Niall Farrell, Taylor Paur, Chris Moorman, John Racener, Brian Hastings, David Peters, Calvin Anderson, Frank Kassela, Jennifer Tilly and Jeff Madsen. Round 2 begins at 12pm Wednesday. There’s $236,498 for the eventual champ, while all 100 players have now won $5,227. The second new event to begin on Tuesday was Event #40: $2,500 Mixed Big Bet. 205 players took their shot, but after ten levels just 51 remain. Naoya Kihara holds the overnight chip lead with 119,700, followed by Dario Sammartino with 117,000. Plenty of other big names have advanced, including the red-hot John Hennigan (111,850), fresh from his $50K runner-up finish. Six-time bracelet winner Jeff Lisandro also had a good day, chip leading for much of it before ending with 90,000. Andrew Kelsall (66,200), Mike Matusow (72,300), Eli Elezra (70,000), David “ODB” Baker (41,075), Barry Greenstein (27,375), and Brian Rast (23,150) also advanced. Play resumes at 2pm Wednesday with 31 players making the money. A min-cash is worth $3,777, while there’s $122,138 for the champ. There are two new events ready to get going on Wednesday. First up is Event #41: $1,500 Limit Hold’em, kicking off at 11am. However, arguably the more exciting of the two is Event #42: $25,000 Pot-Limit Omaha 8-Handed High Roller, which begins at 3pm. James Calderaro took that one down last year, defeating a final table that included the likes of Dario Sammartino, Dan Smith, and Ben Tollerene to claim the $1,289,074 winner’s prize.